What Differentiates Canadian Online Cannabis Retailer Namaste Technologies From Other Pot Stocks? Philip Morris International (NYSE: PM), manufacturer of cigarettes and other nicotine-containing products including reduced-risk products, is set to announce its fourth quarter results on February 7, 2019, followed by a conference call with analysts the same day. The market expects the company to report net revenue (net of excise) of $7.38 billion in Q4, 11.1% lower than Q4 2017. Adjusted earnings for the quarter are expected to be $1.17 per share compared to $1.32 per share in the year-ago period. 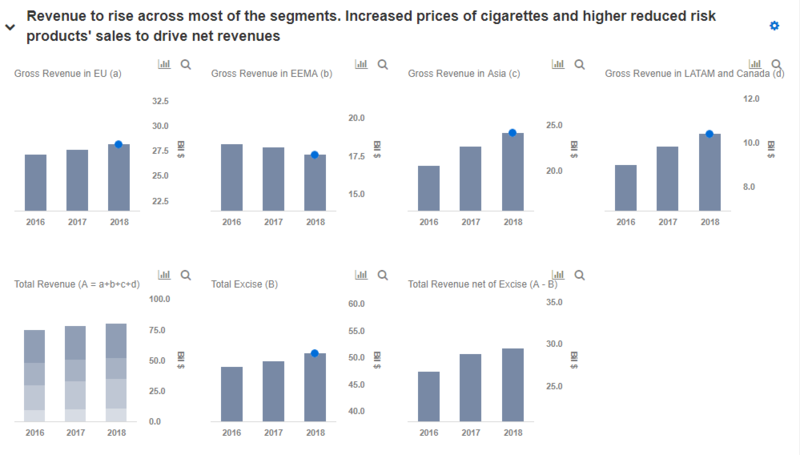 The lower EPS is likely to be the result of a decline in total cigarette volume – slightly offset by rising prices, lower than expected sales growth in the heated tobacco category, and adverse impact of exchange rates. Strengthening of the US dollar is expected to negatively impact EPS by $0.12 for the full year 2018. We have a price estimate of $92 per share for the company, which is higher than its current market price. Our projection for Philip Morris’ key drivers that impact its price estimate are available in our interactive dashboard – Philip Morris’ Q4 2018 Earnings Preview. You can make changes to our assumptions to arrive at your own price estimate for the company. Lower cigarette shipments: As the young generation is not taking to cigarettes in a large number, the demand for combustible products has seen a gradual but steady decline worldwide. This is reflected in declining shipment volume of cigarettes since 2015, mainly driven by increased consumer awareness, health concerns, and shift to non-combustible products. The first nine months of 2018 saw cigarette shipments decline by 2.7% compared to the corresponding period of 2017. With lower cigarette shipments, the company has resorted to price increases to sustain sales. IQOS Growth: Shipments under the heated products category has seen continuous rise over the last three years. 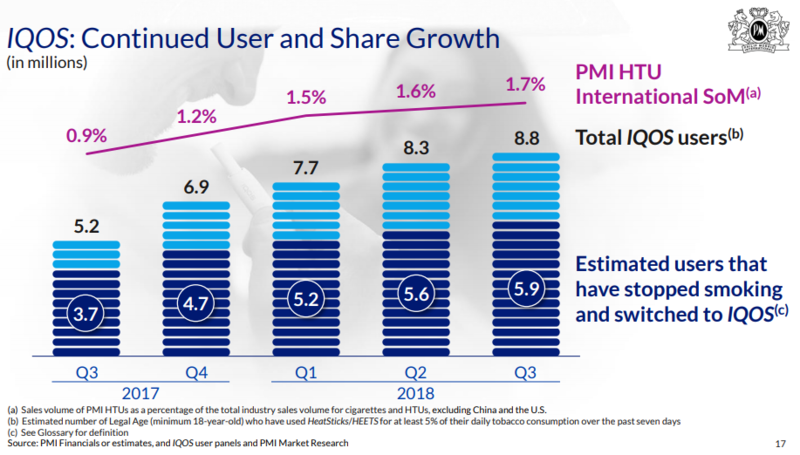 IQOS, the smoke-free product portfolio which includes heated tobacco and nicotine containing vapor products, has seen sales pick up since its launch in 2017. This has driven the entire segment sales, with heated tobacco shipments witnessing significant growth from 0.4 billion units in 2015 to 36.2 billion units as of December 2017. Shipments during the first nine months of 2018 increased by a whopping 42.4% compared to the year-ago period. The increase is driven by IQOS across all geographical segments. IQOS is expected to drive the company’s future growth. Owing to huge discounts and promotional offers, IQOS products have a very low margin currently, which to a large extent offsets high margins from the sale of cigarettes. We expect this trend to continue in Q4 as the company is still promoting the product to get a maximum user base. For FY 2018, we expect Philip Morris’ net revenue to grow by 2.4%. Net revenue of $29.4 billion for the year will be driven by higher sales across all geographies, except EEMA. Eastern Europe, Middle East and Africa is expected to witness a 4.6% drop in total shipments on the back of lower economic growth and a decrease in disposable income. In spite of higher prices, sales from the region are likely to decrease by over 4% during the year. Asia would contribute the most to overall revenue growth with sales from the region expected to be 6.3% higher than in 2017. Profitability: Net income margin for the first nine months of 2018 was 9.5%. We expect margin to remain at this elevated level for full year 2018, benefiting from lower tax outgo and decrease in interest expense. The company’s tax expense is likely to be lower in 2018 as it benefits from the implementation of Tax Cuts and Jobs Act. Philip Morris is also working towards optimizing its capital structure. It decided to use its high cash balance to pay off $2.5 billion of its 10-year U.S. bond in May 2018. This was the most expensive debt, with a coupon of 5.65%, on the company’s balance sheet. Using excess cash instead of refinancing has helped the company reduce interest expense and get rid of expensive debt instruments. Though the company’s stock has seen a tremendous beating in the last couple of months, mainly due to the delay in realizing benefits from IQOS, we believe that it is the segment which will drive the company’s valuation higher in the near future. As the promotional offers and discounts come to an end, the segment will see significant growth, driven by high demand and an increase in margin per unit.